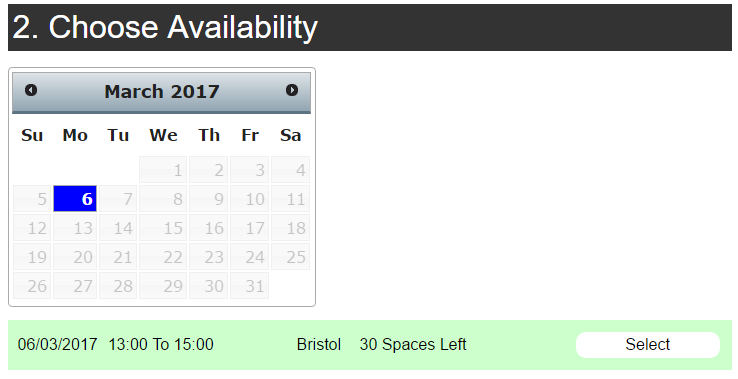 The Booking View is how the Events for a product are displayed to the public. There are several different options to choose from. 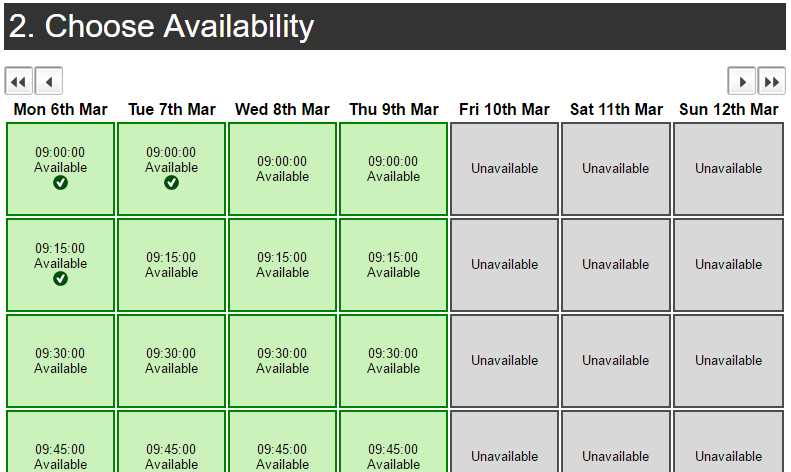 Booking views with the Icon are able to utilise the Waiting List function. The List view presents a simple list of all Published Events for the Product. This is usefull for events that run with a frequency of once per month or less frequently. The List view is best for products that have only a few (<20) events on display at any one time, or with a frequency of twice per month or less. The Calendar view displays a 1 Month calendar with days highlighted which have Events. When a customer selects a day, they are then presented with a List of Events for that day. This is usefull for events that run with a frequency of twice per month or more frequently. The Calendar view is best for products that have quite a few (<365) events on display at any one time, or with a frequency of twice per week or less. The Seven Day view displays a 7 day period (the start date of this 7 day period can be set in the General Settings). 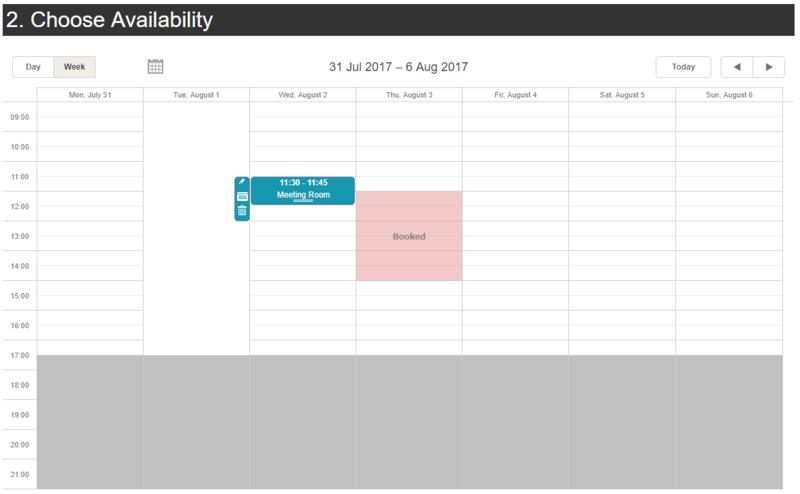 With this view, customers can only select one event from the available options. This is usefull for events that run with a frequency of twice per week or more frequently. The Seven Day view is best for products that have a lot (>365) of events on display at any one time, or with a frequency of twice per week or more. The Seven Day view displays a 7 day period (the start date of this 7 day period can be set in the General Settings). This view differs from the Seven Day view, as a customer can select multiple items on this view and add it to their basket simultaneously. This is usefull for events that run with a frequency of once per day or more frequently. The Seven Day Season view is similar to the Seven Day Multi Select view, except it displays the full range of dates for a Season. The Season view can only work if the events have a frequency of once per day or less. It cannot show multiple events on the same day. 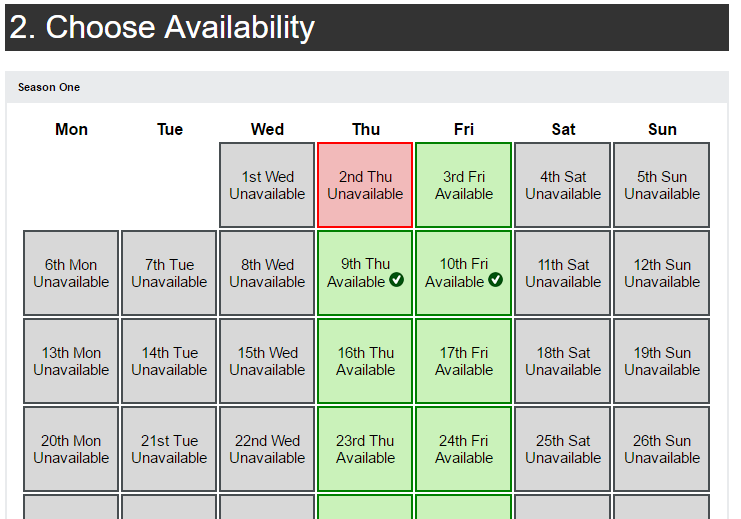 The Outlook view is designed to work with the Room Booking Products. 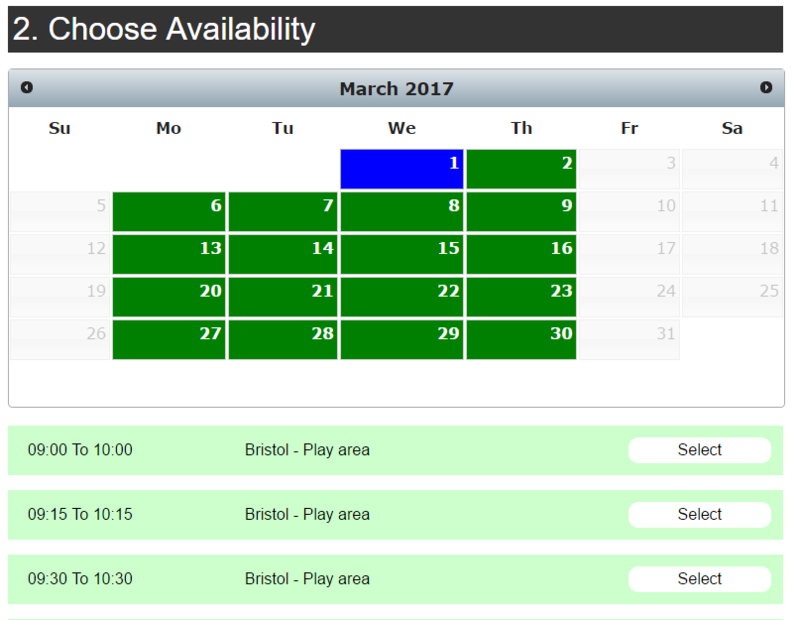 It allows a Customer to select the time frame that they wish to book out the resource for. 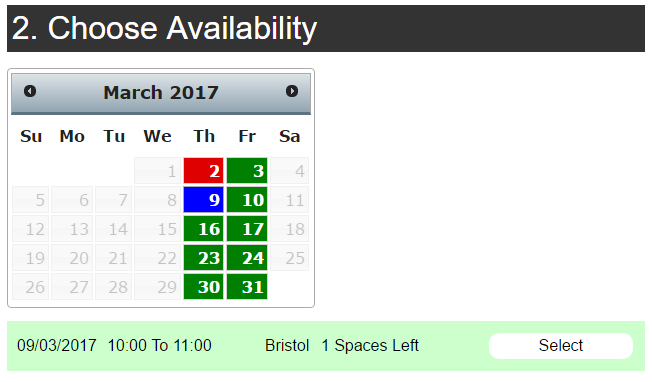 Once a customer has selected the time slot they wish to book, they are given the opportunity to either edit or delete the booking, by clicking on the icons to the left of the time slot. The Session view is used with the Template Event Product type. It allows the user to select a date, then a start time. 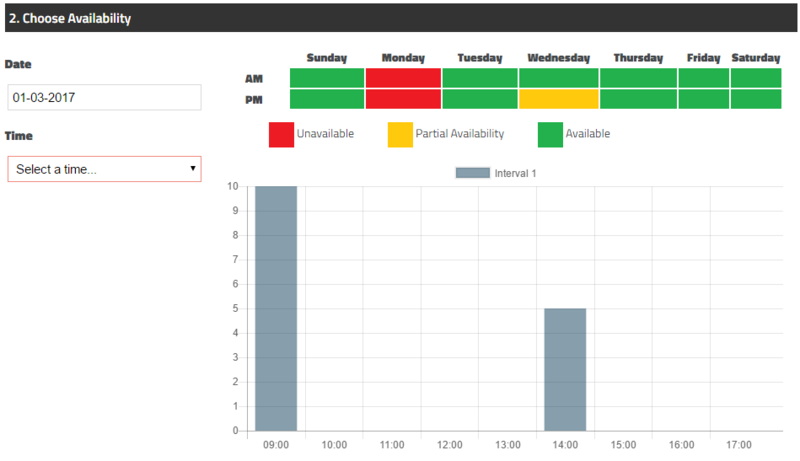 The Session view will then display the availability and usage of the resource for that day.